TDK Corporation exhibited at the CPS (Cyber-Physical System)/IoT (Internet of Things) CEATEC Japan 2018 trade show, which was held at Makuhari Messe from October 16 (Tuesday) to 19 (Friday). We have also released a report that describes what TDK's booth was like and movies of product demonstrations filmed in the venue. We recommend that you view them. If you are not a member of myTDK, you can download the panels by inputting the required information in the form to the right. The theme of TDK's booth this year was "Pioneering Super Smart Society Together." 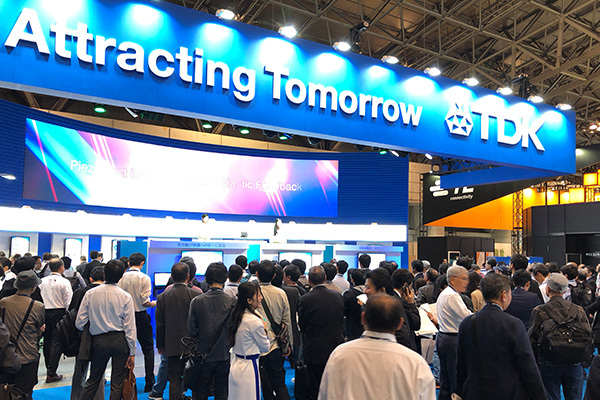 Through stage shows, demonstrations, and exhibits, we introduced TDK's new products and technologies that will contribute to the building of a new society. TDK proposed new uses for its products through conceptual displays. A demonstration of actual devices using CeraCharge™, which is all-ceramic, solid-state battery developed by TDK, was conducted in collaboration with Ricoh Electronic Devices Co., Ltd. and Rohm Co., Ltd.
By generating electricity from sunlight or indoor lighting using photovoltaic cells to charge CeraCharge™, the necessary electric power can be supplied to devices even in the dark. 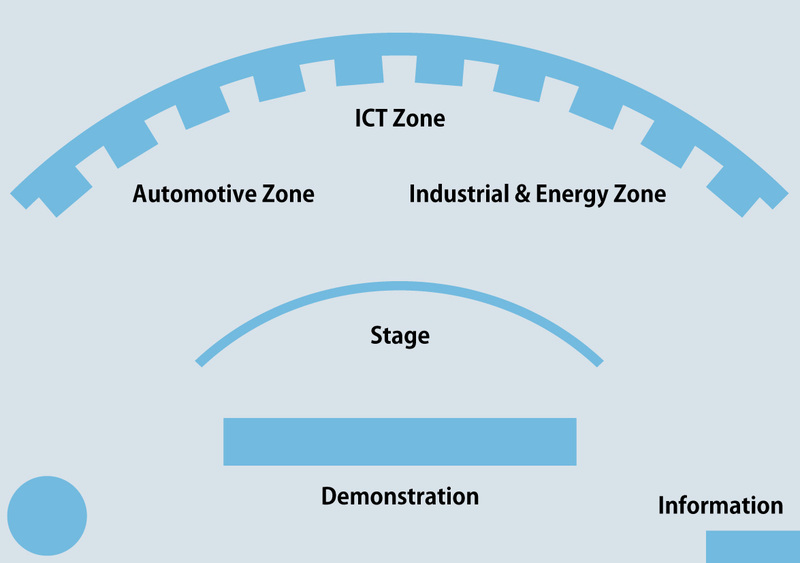 This is one of the proposals from TDK for an new era when everything will be connected to networks using sensors and the Internet of Things (IoT). This was a tactile demonstration using the PiezoHapt™, TDK proprietary low-profile piezo actuator. PiezoHapt™ is in the world's thinnest class at just 0.35 mm thick, has a response time of 1 msec or less, and supports a variety of vibration patterns. A case of collaborations that can be achieved with the actuator was presented. At the event, the picture book, introduced in the video to the right, presented the various fun tactile experiences. This is a proposal for one-touch creation of an in-vehicle environment tailored to the individual. Ultrasonic fingerprint sensor installed in the vehicle identifies specific individuals to switch a light-control window between transparent and opaque using a transparent conductive film, to operate an answer-back function using vibration from a PiezoHapt™ actuator, to open or close electric-power door mirrors, and to take other linked actions. The ultrasonic fingerprint sensor and transparent conductive film are expected to be applied in a wide range of fields from automotive to home security. Be sure to take this opportunity to experience this proposal. October 16 (Tuesday) to 19 (Friday), 2018; 10:00 a.m. - 5:00 p.m.